Know Direction: Beyond 002 – Designing in Space! PaizoCon 2016 029 – What’s New with Legendary Games? Jason Nelson and Neil Spicer, sit down with Ryan to talk at length about their exciting new Adventure Path and campaign setting, Legendary Planets. Wolfgang Baur (Kobold Press), John Ling (Frog God Games), and Jason Nelson (Legendary Games) talk about what it takes to succeed in third party publishing. 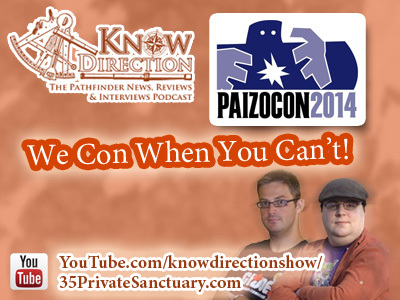 PaizoCon 2014 Special 019 – What’s New With Legendary Games? One of the quickest third part publishers of Pathfinder material to rise to prominence, Legendary Games has been best known for its Adventure Path add-ons. Not anymore. Featuring Jason Nelson, Neil Spicer, Rachel Ventura, Jim Groves, and Clinton Boomer.